Interactive Maps, made by WRC to share with everyone. 7:00 min/mile – 8:00 min/mile AND the 8:00 min/mile – 9:00 min/mile groups running the High Road -Ranger Station Loop through Rock Creek Park for 13.6 miles with the opportunity to add on. 10:00 min/mile group running 8-10 mile out-and-back run on the Capital Crescent Trail out of Georgetown to either Fletcher’s Boat House or the water fountain just beyond the Maryland State Line, respectively. For more information on our routes, click here. If you have questions about our routes, or need a different distance/pace/etc, please send a message to president@washrun.org. NEW POST RUN MEETING PLACE: We’ll be at the Washington Canoe Club after the run starting at 9:00 a.m. If you’re up for it, join us for coffee at Malmaison just down the road. Meet in front of CB2 (33rd and M) at 0700! Get ready for a nice, easy, long run this Sunday! 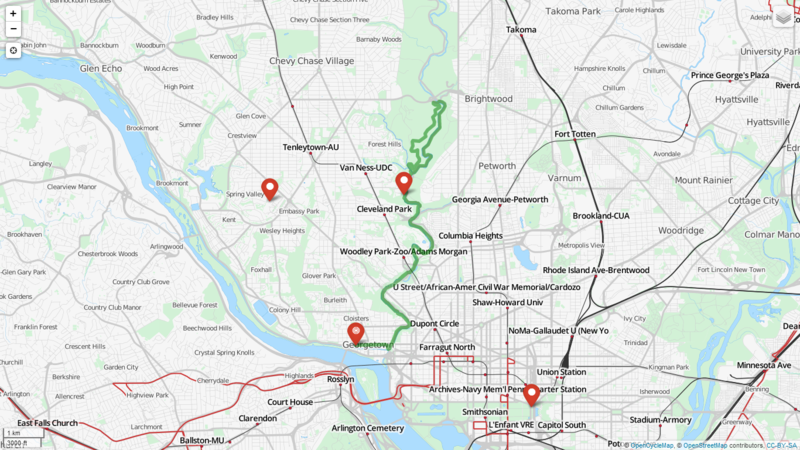 The planned route will be similar to our 2/23 Sunday Distance Run which took us out Custis Trail, through Arlington neighborhoods to Chain Bridge, up the Towpath, and back down MacArthur. This week’s planned route will add a couple miles on for a nice round 24 miles. The primary addition will include exiting Custis Trail onto Bluemont Junction Trail, turning onto W&OD Trail, and cutting back up Custis Trail to continue the route up N. Harrison St through the Arlington neighborhoods. The other (minor) modification will be turn onto the Capitol Crescent Trail off of MacArthur, and finish along Water/K Street. Please review the full 24-mile route map before Sunday! We will have a gatorade/water stop along the towpath between Chain Bridge and the cutover to MacArthur. 10-11 Miles – Continue on Custis Trail toward Rosslyn/Georgetown after the Bluemont/W&OD addition (don’t turn onto N. Harrison St). This Sunday’s Distance Run will include an 18 & change loop that is a slight deviation from the Rock Creek-Capital Crescent Trail loop. We will plan to exit Rock Creek at Wise Road to take a more direct path the to CCT start in Bethesda. There is water at Peirce Mill (around mile 4.5), “probably” somewhere around Wise Road (around mile 8.5), and at B&N (around mile 11.5). Additional mileage options: For 20+ miles – continue around waterfront. For 16 or less – out-and-back on Rock Creek. Please review the route map for the details. Last week’s 20.5 run was a great group effort! I counted around 20 strong pushing through the Arlington hills together. Look forward to seeing everyone again this Sunday! As usual, we will meet at 33rd & M (in front of CB2) and finish at Dean & Deluca. See you this Sunday at 8am sharp! We had a great turnout last week even with the icy trails – some still getting in over 17 miles! The weather is looking pretty good for this Sunday morning (possibly low 40°s), so hope everyone is looking forward to a challenging long run! For those running fewer miles, the route can be cut short by turning back down the Towpath after crossing over Chain Bridge (will be around 13 mile loop). Embiggen. Or else peruse earlier versions, via geojson.io or milermeter. Join WRC for a very special evening of cinema, sport, and culture this January! 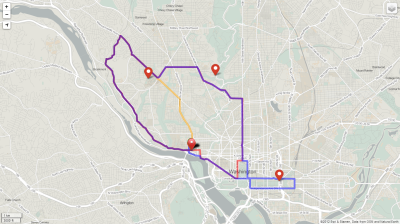 Shutdown Safe Running Routes: in 10, 15, and 20 mile flavors. The government shutdown has closed some of our favorite running routes, including the Capital Crescent Trail and Rock Creek Park, but that won’t stop us from getting in our Sunday long run! It’s supposed to be unseasonably warm on Sunday, so you might want to bring your own water as these routes do not have as many fountains as the ones in the parks. We hope to see you there!